I’m adding another tool to the CityGrid Local, Mobile, Social Stack. This time its a service that allows you to find out the time zone information for a longitude and latitude, called AskGeo. 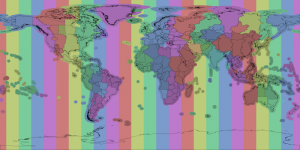 AskGeo is a dead simple REST API that lets you give a latitude and longitude and the API returns the unix (Olson) time zone ID (e.g., “America/Chicago”, “Europe/London”), the Windows Standard Name for the time zone (e.g., “Pacific Standard Time”, “Central European Standard Time”), and the current offset from UTC. The API is free to try, and it is free for non-commercial and personal use. Open source projects, students, and private individuals may use it free of charge, but any user that wishes to use the API for commercial purposes must pay an access fee of $200 per year. Currently they have a Java Library for working with the time zone API, and you can find complete documentation on the AskGeo website. AskGeo is definitely an essential addition to the local, mobile, social stack–I see it providing providing a utility you can use for transit, travel, meeting and other time sensitive aspects of mobile and web application development.